We rarely ask you to take a leap of faith so bear with us on this spectacular hybrid. There really is a plant under that huge bloom. This is one of the early Schick hybrids and the only fault we can find with the plant is it does not offset well. We have spent several years getting the plant up to blooming size but feel it will be at the head of the class whereever it goes. 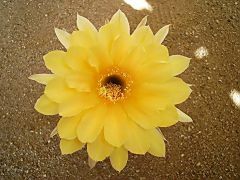 This flower rivals the size of the tricho hybrids that are many, many times larger in body size. This is another marvelous cactus we obtained from Doyt Galloway.